Make your backyard an all-weather sports zone and create the ultimate gathering place for family and friends with a custom outdoor basketball court from Flex Court Athletics. 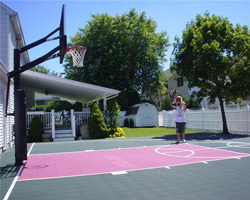 All our backyard basketball courts include multi-purpose sports flooring so you can enjoy all types of activities. With a few easy steps, you can transform your Long Island backyard from a basketball court to a volleyball or racquet sports court. Best of all, our patented multi-sports surfaces are safe for all types of gameplay and practice drills, so you get better-quality practice in the comfort of your own backyard. Flex Court Athletics is different because our indoor and backyard court surfaces have flexion built-in, which is a stress reduction ingredient. Our modular sports surfaces were created with a commitment to orthopedic stability, so our basketball flooring reduces and absorbs impact while reducing both lateral and vertical stress. This allows you to play at high performance like the pros with less muscle fatigue. High levels of traction in our sports tile flooring also propels your performance to improve with each practice. The revolutionary nature of our products is validated by the many endorsements we have received from professional coaches and athletes. Flex Court Athletics offers full-service turnkey installation, assuring your court will be customized to fit your needs perfectly in a timely fashion. 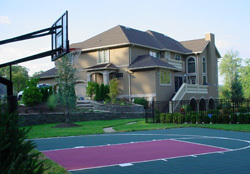 To top it all off, every backyard basketball court we install comes with a lifetime system, including a full 15-year warranty for quality assurance. Play with the same hoops system the pros use and let your family enjoy the basketball, volleyball and racquet games they love without ever leaving home. Schedule a free design consultation with Flex Court Athletics in Long Island, NY today!